The Toll of the Sea (1922) is an American silent drama film, directed by Chester M. Franklin, produced by the Technicolor Motion Picture Corporation, released by Metro Pictures, and featuring Anna May Wong in her first leading role. The film was written by Frances Marion and directed by Chester M. Franklin (brother of director Sidney Franklin), with the lead roles played by Wong and Kenneth Harlan. 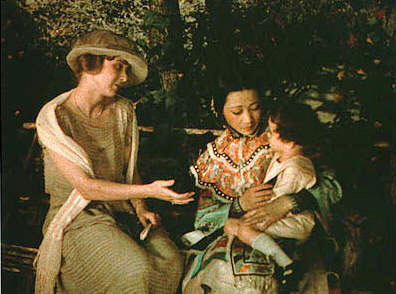 The plot was a variation of the Madama Butterfly story, set in China instead of Japan. The film was the second Technicolor feature (after 1917’s The Gulf Between), the first color feature made in Hollywood, and the first Technicolor color feature anywhere that did not require a special projector to be shown. The film premiered on 26 November 1922 at the Rialto Theatre in New York City, and went into general release on 22 January 1923.